Home + News + Is Paint Thinner Flammable? In 2006, a North Carolina man snuffed out his cigarette in a bowl of paint thinner, which he mistook for water. It ignited, causing minor injuries and setting the house itself on fire. Unfortunately, the fire spread so quickly that firefighters were unable to save it. Paint thinners are flammable. Manage and store them as a flammable materials to prevent incidents at home or in the workplace. What Do the Regulations (OSHA and NFPA) Say About Flammable Materials? OSHA defines different categories of flammable materials. Category divisions depend on the flash point and boiling point of the material. NFPA 30 is a similar standard. It uses the flash point and boiling point to classify chemicals into flammable and combustible liquids. Check the Safety Data Sheet (SDS) of any flammable paint thinners used. This paint thinner SDS identifies it as a Category 3 flammable material in terms of the OSHA standard. This means it has a flash point in the range 73.4 to 140 F (23 to 60 C). 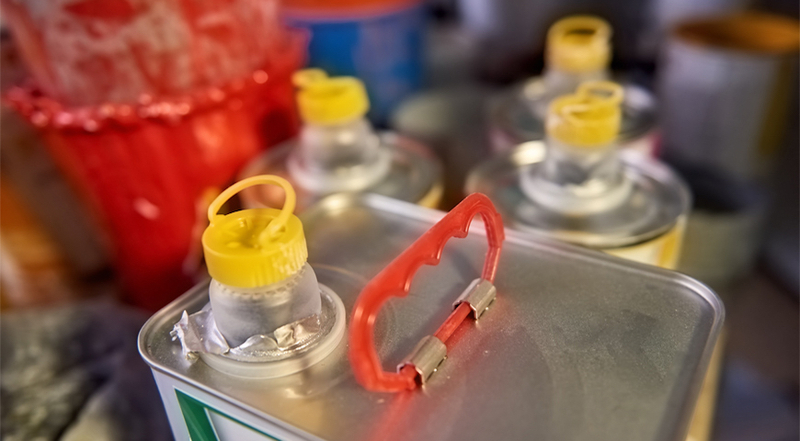 A single safety cabinet may contain up to 60 gallons of paint thinner. One storage area may hold up to three safety cabinets. Is paint thinner flammable? Yes, and it should be stored as a flammable material or chemical. Justrite Sure-Grip EX Safety Cabinets for Combustibles provide safe storage options for combustibles, making it easy to identify, organize and segregate dangerous chemicals. They protect flammables like paint thinners from fire by providing a heat-resistant enclosure. Safety cabinets also provide time for personnel to evacuate the facility and fire fighters to extinguish the blaze. The disposal of waste containing paint thinner residue presents another danger. Old rags or paper towels used to wipe paint thinners or brushes create a fire risk. Under the right conditions, these waste materials can spontaneously combust. Use Justrite Oily Waste Cans to dispose of flammable waste. They prevent ignition sources from reaching the waste. Because of their air tight seal, they also limit the possibility for spontaneous combustion. Justrite safety cabinets store paint thinners and other combustibles safely. They help companies comply with regulations. Order your safety cabinet today to prevent fines from regulators and improve the safety of your facility. Find out more about safety cabinets for combustible materials. Good information ... clear, concise, and shows how easily accidents can happen.